This clear waterproof pouch is a great for protecting your camera, cell phone, mp3 player or any other small electronic device while on the boat or near the water. 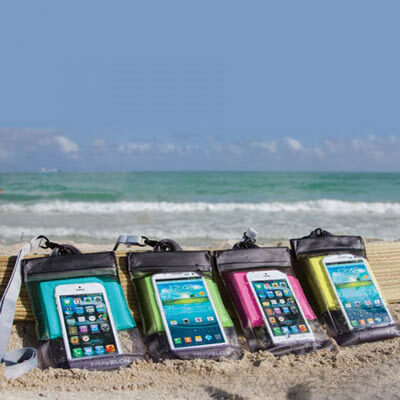 The waterproof phone case fits virtually all smart phones and pocket digital cameras and features a soft outer surface that allows you to control your personal electronic devices without taking them out of the case. Inside Dimeensions: 4.25" x 6.25"
This phone holder is big enough to hold my 5.5 inches smartphone. The foam can can float this heavy phone. The orange color is very noticeable in the water. It is a good product, I like it.